Centerpiece of the kitchen. Love! I love this sink! It looks great and is so functional especially with the bottom grate that protects the bottom finish, they even sent extra rubber feet. The faucet is great as it swivels as well as being able to pull the sprayer and get water right where you want it. The published description was accurate. I highly recommend this product. Recently remodeled/updated our kitchen. 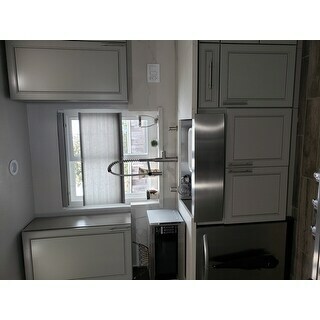 Purchased this sink and faucet combo before we even started. Love the depth and width of the sink. The commercial size faucet is excellent for cleaning my pots. Love this sink! It’s perfect for our kitchen. It’s extremely durable, the stainless steel still doesn’t have any marks on it. Love the depth of this sink as well-no more splashing of water all over my counters! Came in quick and was the quality expected. I recommend this to anyone. Well worth the money. The sink installed easy and seems to be of very good quality. I absolutely love this beautiful sink. Cant wait to install it. The faucet that comes with it seems very durable and heavy. We arr building a house and it will be such an awesome addition to the kitchen. Beautiful and great price. This sink included many cost-saving add-ons, including wire grid protector, faucet and soap dispenser. I will add another review and photo when installed. Beautiful sink. Love it! Really adds the perfect finish to a farmhouse kitchen. 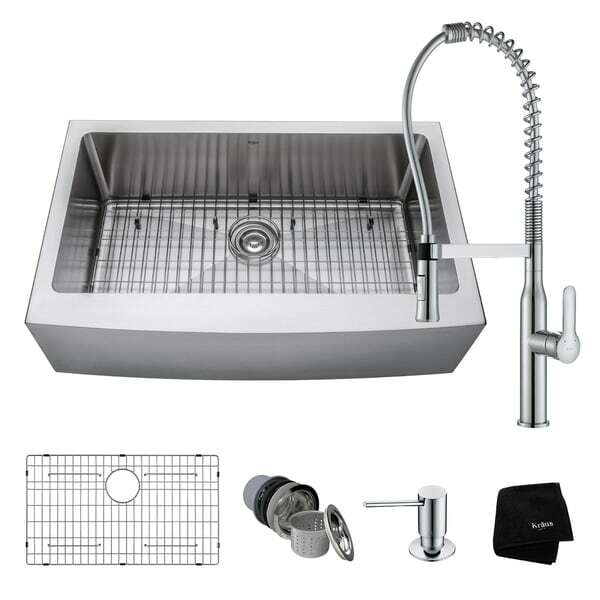 Great product love the size of the sink and the faucet works perfectly!!! Love this sink!!! Great size, love the faucet too. This is a great farmhouse sink and faucet. It really helps to modernize my renovated kitchen. Do need to buy a separate sink drain for garbage disposal use. I love my Kraus Farmhouse Sink! Absolutely beautiful, many compliments! "Can you add a small (18') smooth flat cooktop to this piece?" "I purchased this sink, & just had it installed 2 weeks ago. I have noticed a tarnish already happening. It also already has several very noticeable scratches. I have barely used it! Very concerned, & seeking advice, on how to remedy the problem. Please help! " Scratches are inevitable in any sink material, including stainless steel. These are merely usage scratches. Overtime, these scratches will become uniform with the sink's grain and blend into the overall finish of your sink with proper cleaning. Most minor scratches can be softened with a fine (white) 3M Scotch Brite pad, or 3M Scotch Brite Natural Fiber Non-Scratch Scour Pad, accompanied by a deep cleansing agent such as Bar Keepers Friend. Begin by wetting your 3M Scotch Brite pad, apply the recommended cleansing agent and rub in the direction of the grain of the steel. Rubbing against the grain may dull the finish. You must rub across the entire surface, not only in one area. Always rinse thoroughly and dry when finished. Needed a stainless steel farm style sink because I have so much cast Iron cookware!